Winter is almost behind us, but summer has yet to show her face, and we are urged to consider home insulation to keep the cold at bay. The good news about home insulation is that it even keeps the summer heat out, so it is an all-year heating and cooling solution. Home insulation can be applied to walls, ceilings, geysers and even windows and doors. There are many ways in which to insulate your home against fluctuating temperatures, and many South Africans are now enjoying the benefits of double glazed glass for their windows, for example. Many older buildings contain asbestos, as it was a popular insulating material used between 1900 and 1970. It is now recognised as a harmful and dangerous material, and other polyester-based insulators are used in modern houses. Most of these materials are fibrous in structure and still pose health risks in the form of breathing complaints and allergies. An innovative new home insulation material presents none of the risks of previous insulating materials. ISOTHERM manufactures non-toxic thermally-bonded polyester insulation rolls made from recycled plastic PET bottles. This material is non-allergenic, non-irritant and non-toxic, as well as fire-proof. Its safety features are only outweighed by its energy efficiency and effectiveness as an insulation material. 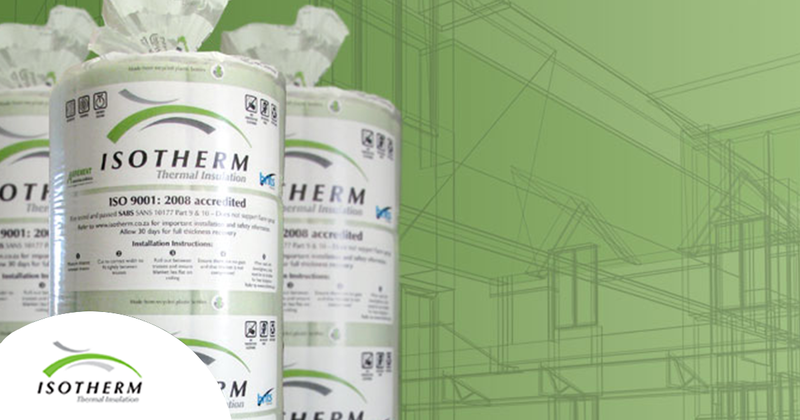 When installed in walls, ISOTHERM reduces energy usage by 40 to 70 percent. It is commonly known that heat rises, and much of your home’s heating can escape through the roof. It is therefore imperative to insulate your ceiling to prevent this heat loss. When installed in ceilings, ISOTHERM can reduce monthly energy costs by about 21 percent. Geysers are often attached to the exterior of your home, and are exposed to the colder outdoor temperatures. Heat is lost through the geyser, and colder weather means more energy is required to heat the geyser again. Keeping an outside geyser running is very costly. Cover and insulate your geyser, saving you another 21 percent on your electricity costs. Why choose ISOTHERM for your home insulation? ISOTHERM is supplied in 750mm and 1200mm wide rolls, and can be easily torn or cut with kitchen scissors to fit your roof, walls, geysers or pipes. The rolls are easy to spread out and can be cut to specific size requirements. The installation is very simple and can be handled by any DIY home improvers, builders or by their own installers. Unlike asbestos and other fibrous insulation sheets, ISOTHERM has no loose fibres and is soft and pleasant to the touch, making is easy to handle. Protective gear is not necessary during installation as it is a completely safe product. Apart from its easy installation, ISOTHERM offers a number of benefits for home insulation. It is eco-friendly. Recycled from PET plastic bottles, ISOTHERM is a thermally-bonded polyester that is friendly to both people and the environment. The product itself is also recyclable. The insulation will also help save energy by reducing the use of heaters and air coolers. It is also an accredited and safety-tested material. ISOTHERM are in compliance with recognised quality standards, such as the South African Bureau of Standards (SABS), and proof of qualitative associations with TIASA and others. ISOTHERM is also Agrément certified, one of the highest quality standards worldwide, and have earned ISO 9001 accreditation. It also complies with SANS 10400, the application of the national building regulations, as an insulation material. ISOTHERM is a cost-effective, long-lasting investment that will save energy and money by reducing the need for temperature-regulating appliances. It is durable and maintenance-free, and will not collapse as it retains its structure over time. It is also resistant to condensation and the fungi and bacteria that result from damp conditions, which further reduces health risks. ISOTHERM’S home insulation material goes a long way to warming your home and saving you energy. In those cold winter months, home insulation is just one method of keeping warm. Double-glazing windows and doors, thermal layers in the ceilings, and thermal blinds are also good measures, and affordable options can often be found for each. Never underestimate the value of a good woollen blanket, a cup of hot chocolate and a roaring fire too!